If blurring the lines society draws between living and artmaking was a necessity to a generation of artists in the 1960s, Lea Lublin was one who made it a virtue. Displaying the most important works of her creative output of three decades, the first retrospective of this surprisingly unknown French Argentine artist opens with her pink neon sign, L’oeil alerte (The Open Eye), 1991. More than just a glossy statement, it introduces Lublin’s modus operandi of deconstructing not only art-historical imagery but the passive act of looking, when she invites viewers to experience her art via the active involvement of their bodies. Improvising on Duchamp’s notion of the readymade, “Voir clair” (See Clearly) 1965 is a series of reproduced iconic images, here represented by Leonardo’s Mona Lisa, behind a glass frame with a fully functioning windshield wiper, at which viewers are invited to shoot with a water pistol. Lublin’s sensorial approach takes an intellectually confrontational turn in a sequence of striking videos, one capturing an intimate conversation between Hannah Wilke and a group of schoolkids on the effects and meaning of acts that turn everyday objects, such as chewing gum, into sculpture. 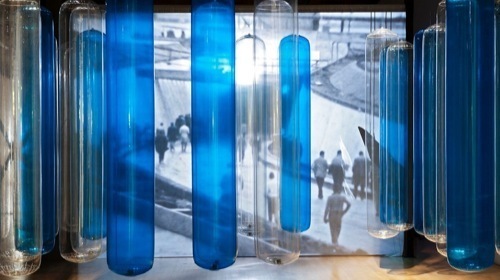 Joined by performance photographs and sketches, her provocative environment Fluvio Subtunal, 1969, is a Parkour course of nine zones confronting “the concepts of nature and technology,” as the artist calls them, including shallow water basins, accumulations of inflatable plastic shapes, CCTV monitors, and a blacklight-filled space with local varieties of vegetables. These are concepts that resonate today, evoking the conflict between public surveillance and the return to nature. Whether through the physical deconstruction of reproduced Renaissance Virgin-and-child paintings or the reappropriation Duchamp’s fountain as the womb of a glass female torso, Lublin, as a female artist working within male-dominated traditions, systematically reflects the objectification of women’s bodies.